This week, University of Lynchburg physics professor and sports physicist Dr. John Eric Goff appeared on Playing with Science, a podcast on world-famous astrophysicist Neil deGrasse Tyson’s StarTalk radio network. Dr. Goff is a regular guest on the podcast. While the episode was a repeat, it included a new conversation with Dr. Goff about his 2018 Tour de France predictions. Using physics to make predictions about the 2,500-mile bike race is an annual tradition for Dr. Goff. 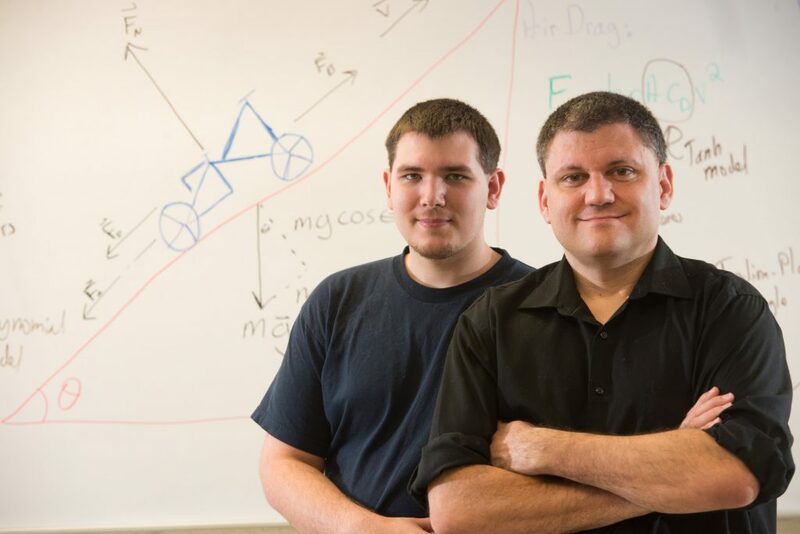 For more than a decade, he and his students have used the laws of physics to model the Tour de France. Using data about cyclist power and the race’s elevation profile, they try to predict the winning time for each of the race’s 21 stages. Often, their predictions come incredibly close, such as the year they predicted seven stages within 1 percent of the actual finish time. Carl Pilat ’20 (left) is working with Dr. John Eric Goff (right) this summer to make predictions about the Tour de France. This year, physics major Carl Pilat ’20 is helping Dr. Goff. “Carl was a student in my calculus-based introductory physics course last year,” Dr. Goff said on July 19, when the cyclists were about halfway through the race. “He lives locally, so I invited him to join me in modeling this year’s Tour de France. Appearing with Dr. Goff on this episode of Playing with Science were hosts Chuck Nice and Gary O’Reilly and legendary — albeit, controversial — cyclist Lance Armstrong. Tyson also stopped by the podcast for a visit. For a more in-depth look at how Dr. Goff and his students make their predictions, watch this video. You also can read more about Dr. Goff’s research on his blog and Facebook page.